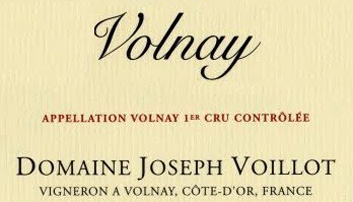 This venerable fifth-generation domaine has holdings in the top vineyards of both Volnay and Pommard. Chez Voillot is quite conscientious with their 23 acres of vines. Yields average 36-38 hectoliters per hectare; harvesting is by hand with small bins after a selection in the vineyard, and further selection is made on a sorting table. It’s worth noting that their team of experienced harvesters has remained virtually unchanged for well over a decade. Vinification is done without stems and afterwards the wine is moved by gravity into barrel. In good years, no more than 30% new oak barrels are used for aging the premier crus, and SO2 is kept to a minimum. It’s immediately evident when tasting through the domaine’s range that these are true vins de terroir (this is a grower who doesn’t like big oak or big extraction; this man likes fruit and soil). Each wine at every level reflects its origin.